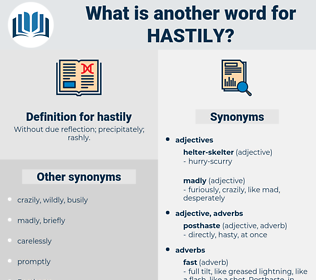 What is another word for hastily? Without due reflection; precipitately; rashly. precipitously, quickly, lightly, swiftly, urgently, rapidly, speedily, recklessly, prematurely, summarily, immediately, promptly, easily, expeditiously, soon, readily, fast. straight, systematic, organized, methodical, carefully. hesitatingly, designedly, haltingly, tentatively, calculatingly, deliberately, circumspectly, hesitantly, leisurely, Studiedly, belatedly, lingeringly, ploddingly, falteringly. And he hastily left the room. Stover hastily put the arm away from him.